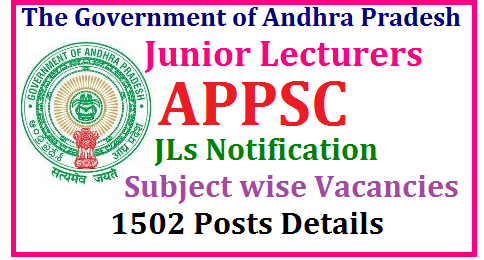 Andhra Pradesh Public Service Commission (APPSC) has Released soon a Latest Notification for 1502 JL Junior Lecturer Posts on its Official Website www.psc.ap.gov.in. All Eligible and interested Candidates can apply after reading complete details of the APPSC JL Recruitment Notification 2017. Jobsbadi provides full details like Educational Qualifications And Experiences Requirement, Exam Pattern, Syllabus, Age Limit, Selection Criteria, Admit Card, Results, Exam Date etc., Aspirants and Andhra Pradesh Govt Jobs seekers can apply for AP JL Junior Lecturer Recruitment through Online before last Date . Junior Lecturers in various subjects :A second class P.G. Degree in (M.A. or M.Sc., or M.Com., OR B.A.(Hons.) or B.Sc.(Hons.) or B.Com. (Hons.) in the relevant subject/language with a minimum of 50% marks in P.G. Degree Examination as recognised by the U.G.C. Junior Lecturers in CIVICS subject only : A second class P.G. Degree in Politics or Political Science orPublic Administration with a minimum of 50% marks or itsequivalent as recognised by the U.G.C. Good academic record with a minimum of 55% of the marks or an equivalent Grade of B in the 7 point scale with letter grades O, A, B, C, D, E & F at the Masters Degree level, in the relevant subject, obtained from the Universities recognized in India. Should have passed National Eligibility Test (NET) for lecturers conducted by UGC, CSIR or similar test accredited by the UGC or SLET conducted by the Andhra University in terms of Higher Education (CE-1-I), Dept., Dt. 24/02/2017. N.B.:1. A relaxation of 5% marks may be provided, from (55% to 50% of marks) at the Master’s Level for the SC/ST/PH category. (2)- A relaxation of 5% marks may be provided, (from 55% to 50% of marks) to the Ph.D., Degree holder who have passed their Master’s Degree prior to 19.09.1991(3) – NET/SLET shall remain the minimum eligibility condition for recruitment and appointment of Lecturers in Government Degree CollegesProvided, however, that candidates who are or have been awarded Ph.D degree in compliance of the University Grants Commission (minimum standards and procedure for award of Ph.D. Degree) Regulation, 2009 shall be exempted from the requirements of the minimum eligibility condition of NET / SLET for recruitments and appointment of Lecturers in Government Degree Colleges. I have completed M.sc Micro Biology in 2016 with percentage of 73.I above notification which subject am i eligible to apply for the Junior Lecturer. So. Finally net or slet compulsory....?